Whilst the history of Goldwork goes way back, its origins are long since lost, with one of the earliest known historical references being found in the Bible (Exodus 28 & 39). It is widely believed that goldwork embroidery originated in China, with the craft itself spreading across the continents with the silk caravans, to Asia, Persia, India, the Middle East, as well as the ancient civilisations of Assyria, Babylonia and Egypt. It also reached North Africa, Spain, Italy, Western Europe, Great Britain, Scandinavia and latterly North America. One of the oldest and finest surviving examples of goldwork, are the fragments of stole and maniple of Saint Cuthburt (Durham Cathedral), which were found in his coffin. Stitched between 909 and 916, it shows surface couching of pure gold thread wrapped around a silk core. Opus Anglicanum (or English work) stretched from 1050 to 1380 and was at its height between 1250 to 1350 (The Great Period). 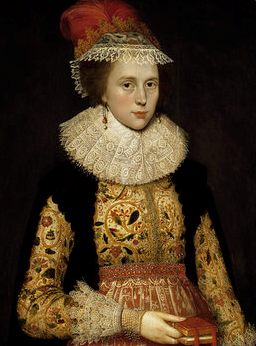 It was a time where English Embroidery excelled and its reputation extended far beyond England. In Italy and Spain (especially) many fine vestments bear unmistakable evidence of an English origin. Some articles may have originally been offerings to Rome, and redistributed to churches elsewhere. In 1246, Pope Innocent IV reportedly had admired the gold-embroidered vestments suggesting to the abbots of the Cistercian order (in England) his desire to have some gold embroideries sent to him. This indicates that English work was becoming better known on the continent. In 1295 the Vatican Inventory listed more examples of Opus Anglicanum than any other type of embroidery. Most of the embroidery was carried out in London workshops by master embroiderers, and were costly. 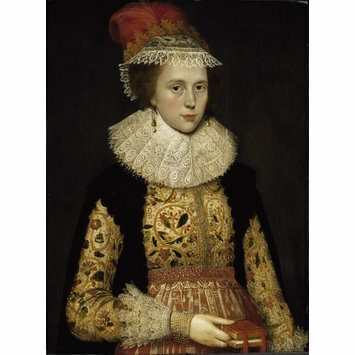 Completed pieces had considerable value thanks to the gold, silver and silver gilt* threads, seed pearls and semi-precious stones that adorned them. Its subsequent decline has been linked to the Black Death, where many professional embroiderers lost their lives to the disease. The disease (ironically) is said to have travelled from central Asia along the silk route, finally reaching England in around 1348. The Syon (1300-1320) and Butler Bowden copes are some of the finest examples of this period. The Syon cope (taking its name from the monastery of Syon) during the dissolution, was taken by nuns who had wandered through France, Spain and Portugal, before returning the cope to Great Britain in 1830, when the nuns returned from Lisbon. The cope shows a goldwork technique known as “underside couching” which creates a ‘hinge’ that gave the work flexibility. It was not unusual for worn out articles to be burned to recover the gold. An example was Archbishop Lanfranc’s worn out chausables and copes that were reduced to ashes in 1371-73 “for the sake of the gold in the embroidery”. A period of decline which some texts refer to as “Decline and Revival 1330-1530” followed. It was felt that designs and skills were of lesser quality, including ecclesiastical embroidery. Having developed a marked style, differing considerably from earlier periods, figures become shorter and clumsy looking. Twisted columns were being replaced with square pillars. Devices such as Fleur-de-Lys, Tudor roses and others of floral character, were used, with arrangements of radiating lines, dotted with spangles, this added considerably to the lightness and contrast between the gold embroidery and the darker ground fabrics. During the 15th century the practice of embroidering motifs separately, to be then cut out and applied to silk or velvet ground, were then further enhanced by couching gold and silver threads to the ground material, around the motifs. Early in the 15th Century Or Nue (also referred to as Italian shading or shaded gold) soon surpassed other goldwork techniques. This form of Goldwork embroidery, where pairs of gold thread are couched in place with different coloured silk threads to form patterns or create pictures. The technique itself is one of the most time-consuming of techniques, but it allowed embroiderers the opportunity to imitate painted pictures. Even Raphael was commissioned to create embroidery designs. Often depicting figures or narrative scenes, these were deliberately stitched so that the metal shows through. The density and placement of the silk over-stitching makes the design. The entire design, background and foreground, is stitched, using small upright stitches. This period, famous for the reformation, witnessed a notable decline in the demand for ecclesiastical work but also sadly saw the destruction of many pieces. Many of the pieces were either destroyed to recover the gold or recycled for other uses, such as cushions (a must have accessory of the day) and interior decoration. Fortunately, some examples still exist for us to see today, thanks to those who risked their lives smuggling the same to the continent. With that said, however, the then industry evolving around personal adornment, interior decoration and costume, saw Goldwork embroidery remain in favour, with the technique lavishly used as a means of displaying wealth. Much of the elaborate work was executed by professional houses with emphasis put on the skill of the professional male embroiderer, who would have had to have served upwards of an 8 year apprenticeship, before being allowed to work on such valuable pieces. Some of the larger private houses may also have had their own team of embroiderers. One historical article detailed over 400 ounces of gold having been removed from one of Henry VIIIs robes, alone. This period also saw ladies and their aides working embroidery for their own occupation. Bess of Hardwick and Mary Queen of Scots were both accomplished needlewomen, and completed several pieces of goldwork – these survive today and can be seen at both Hardwick Hall and the Victoria & Albert Museum (UK). The Hardwick embroideries consisted of two shades of gold (silver-gilt*) wound around cores of orange or pale yellow, and silver wound around a core of white. There is also mention of file and pearl, as well as metal ornaments such as domed spangles (ranging from 4mm to 1cm in size), figure of eight and pear shaped spangles and tiny- ring like metal beads. Amateur and domestic embroidery also gave rise to new techniques, having been adapted for execution by the non-professional. Supplies were sold by travelling salesmen, as well as materials imported from Europe. This period also saw the introduction of printed pattern books. Processes for producing metal thread had also advanced, resulting in finer threads being made which also saw lace being made with gold thread, as well as sweetbags, bookbindings and caskets. The latter end of this period saw a fashion for unpicking the metal threads from costumes and uniforms. A phrase coined as “drizzling” was the occupation of the wealthier lady to raise a little pin money, with tales of uniformed gentleman losing their gold adornments whilst watching performances, where ladies would carry a small workbag containing scissors and a drizzling tool (it had a sharp triangular blade) to quickly snip away at the stitches that held the gold to the garment. Social gatherings were reportedly arranged for just this purpose. Goldwork, at this time, had all but disappeared from fashion. Ecclesiastical vestments where still in demand on the continent, and by the mid 1800s England experienced a revival, likely encouraged by the Gothic Revival or Arts and Crafts movement, with designers such as Pugin and William Morris where embroidered textiles feature naturalistic motifs were filled with richly coloured silks and outlined in gold threads. “The Art of the Embroiderer” by Charles Germain du Saint-Aubin, Designer to the King (XV), 1770 is the book to sum up the designs and methods of this century. It was re-published in translation in 1983. Goldwork has also played an important part in both military uniform and civil or ceremonial regalia, the decoration of which is often guided by strict protocol. Goldwork is meticulously couched using techniques such as card padding which provides a crisp and sharp outline. Ornaments tend to be stitched as a separate piece and later attached to the garment, which is finished by edging it with either pearl purl or military wire. 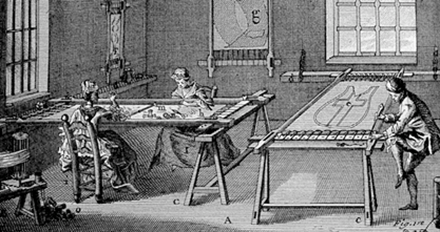 These methods are still used in workrooms today. Moving our attention to Spain, the 18th century saw the “suit of light” replace the bull fighters traditional wear of leather and woollen cloth, replacing them with colourful silks and breathtaking examples of Goldwork. 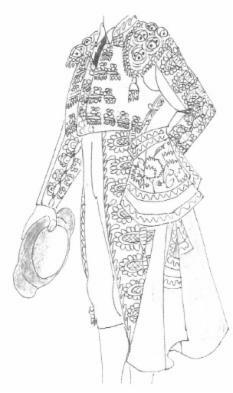 Only the Matador( the one who has previously killed the bull) is allowed to wear gold, whilst his assistants, whether they be banderilleros or picadors, wear silver. There is a lot of superstition behind the colour the fighter might chose to wear and should they or a close relative or friend be injured, the colour is considered unlucky. The jacket alone can weigh between 6 to 8 pounds. Goldwork today is still an important element of military, ceremonial and religious pieces, although real gold threads are hard to source or exponentially costly. 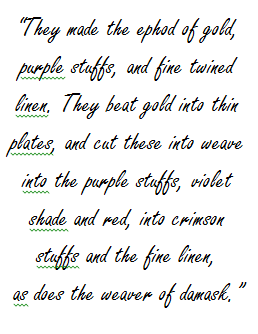 Now the domestic embroiderer has a vast choice of threads to draw from, both metal and non-metal, and obtainable not only in gold (gilt), silver and copper, but also a wide range of colours. Pair this with the wide range of fabrics and textures available, combine Goldwork with other embroidery techniques, and the 21st century embroiderer is still able to create and produce wonderful, and exciting contemporary pieces. *Gilt threads are made of silver with a coating of gold. The thicker the coating the greater the cost, and the greater the coating, the less they tarnish. In eastern countries and France (in the 17th Century), some of the threads were silver or gold on a copper base, otherwise known as False Gold or False Silver. There are a wealth of books available, both old and new. Some are easily sourced from second hand book shops, eBay, and a wealth of other well known online book retailers, whilst others are rare or out of print; you could also try your local library. Titles are ordered in alphabetical order by book title.